So aside from living the quiet life in Terenure, I’m also here to see a massive amount of theatre. Here are three I saw in June, along with a few brief thoughts of my own. This was the show I was most excited to see, and the one I was most disappointed with. Punchdrunk stages their shows in massive spaces like old hotels and abandoned warehouses, and transforms them into interactive worlds where the audience and performers share the same space. All audience members are masked at the start and then set loose to wander through multiple floors of an imagined Hollywood film studio in the mid-20th Century. Few words are spoken, and most of the action is done via dance and mime. You are encouraged to wander freely through the space, creating your own version of the show, which will be different than everyone else’s version. Some audience members attend multiple stagings, searching for new scenes and clues, dissecting everything on Tumblr, desperately trying to figure out what it all means. But, as many a rabid fan of shows like Lost or Twin Peaks (which The Drowned Man owes a lot to) can admit to, obsessing about the forest oftentimes means missing out on the trees right in front of you. I had no idea what the show was supposed to be about**, and instead just enjoyed the intricate set design, the expert choreography, and the overall spooky mood of the show. There’s something interesting about the audience members wearing masks, and how the anonymity allows you to, in a sense, become part of the show. My own movements became a bit more smooth and sinister as I moved from room to room, stumbling upon a scene in media res, or surprising a couple of audience members rifling through desk drawers, searching for those ever-elusive clues. In the end, though, a little of that type of show goes a long way. After a while you want some Story to suddenly step in amidst all the artful clutter and creepy straw men. The same basic conflict was repeated over and over again, and I grew bored watching couples flirt, fight, and murder each other. There’s a reason these 400-year old plays by Shakespeare are still being performed in the West End, on Broadway, in parks and schools and studied in classrooms around the world: the man knew how to write a good story. Lear was directed by Sam Mendes. You might know him as the guy who directed American Beauty, and Skyfall, but he’s got a rather extensive theatre background as well. This was at the National Theatre, the one with the statue of Laurence Olivier out front, so you walk in with certain…expectations. And boy were they met. I’m fairly new to Lear, having never been assigned it in school or seen it performed live before, or even on film. The closest I came was my old gig as Colin Firth’s stand-in for A Thousand Acres, a forgotten film based on Jane Smiley’s novel (which is based on Lear the stage play) about a farmer who divides up his land amongst his three daughters. 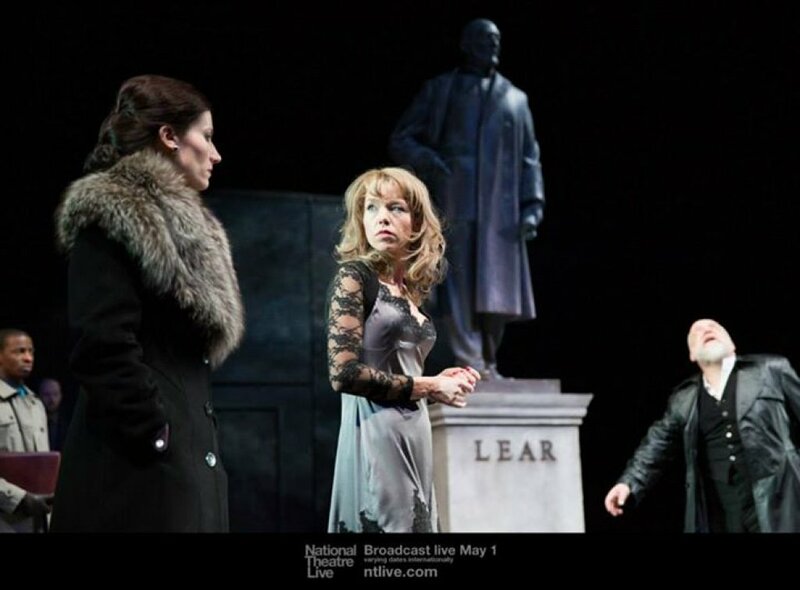 In the original, though, Lear is an English king who divides up his kingdom amongst his three daughters, and then everything falls apart. Lear quickly succumbs to dementia and madness, is cast out, and by the end of the play most everyone is dead. Typical Shakespearean tragedy. 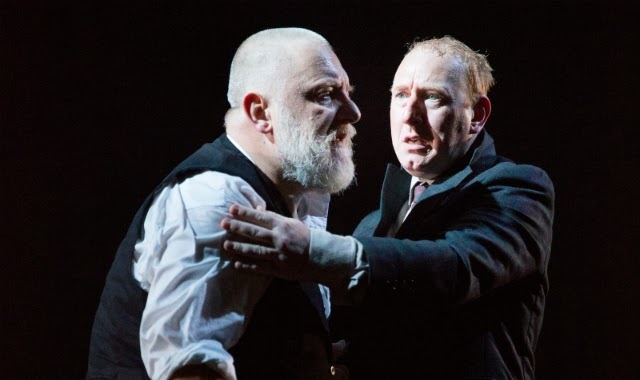 There’s lots I could say about the show, but I figure most of my readers started to fast-forward once I busted out the phrase “in media res”, so i’ll wrap this up and just say I thought it was great, and Simon Russell Beale, as Lear, was heartbreaking. As someone who has seen a grandparent suffer and die from Alzheimer’s, I can say very truthfully that he got it. 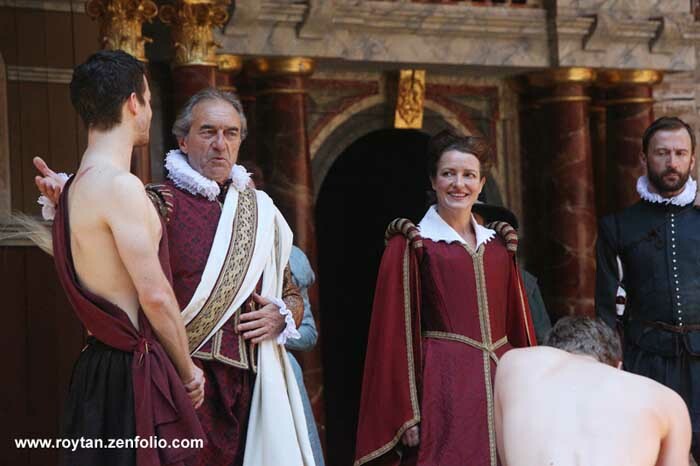 Julius Caesar at Shakespeare’s Globe, Written by William Shakespeare, Directed by Dominic Dromgoole, Artistic Director of The Globe. Later that night Kevin and I attended the third show we had booked, a Renaissance-staged production of Julius Caesar at the reconstructed Globe Theatre. 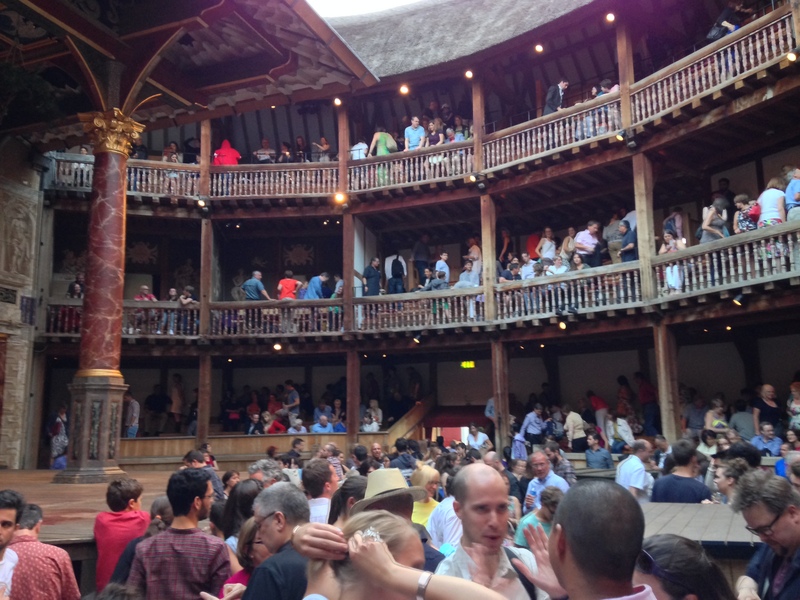 I could probably write an entire post just on The Globe, and maybe I will someday, because I need to give a proper telling to the brief hello I was able to give Mark Rylance that night. Chills and butterflies, people. Anyway, what the Globe does best is show how well Shakespeare’s plays work when presented in their original setting. There are no lighting tricks, no real scenery to speak of, just a bare stage where the actors make the words come to life. It’s all you need with him. Story is everything. Not much needs to be said about this one. Most people know the plot, and I’ve directed it in the past, so part of the fun was seeing how the pros do it, compared to my own (former) youthful company of players. We didn’t have actual seats, but went the cheap route and bought groundlings tickets and stood stock-still the entire time. The air gets rather close inside that wooden O, and a few people had to leave because they were about to faint. One guy fell right to the ground right next to me, but that might have been because of the “blood” in the play. There’s Kevin! Actual proof that he and I were in London together. I have more to say about this remarkable place, and more about the London trip in general, so I’ll write more tomorrow. 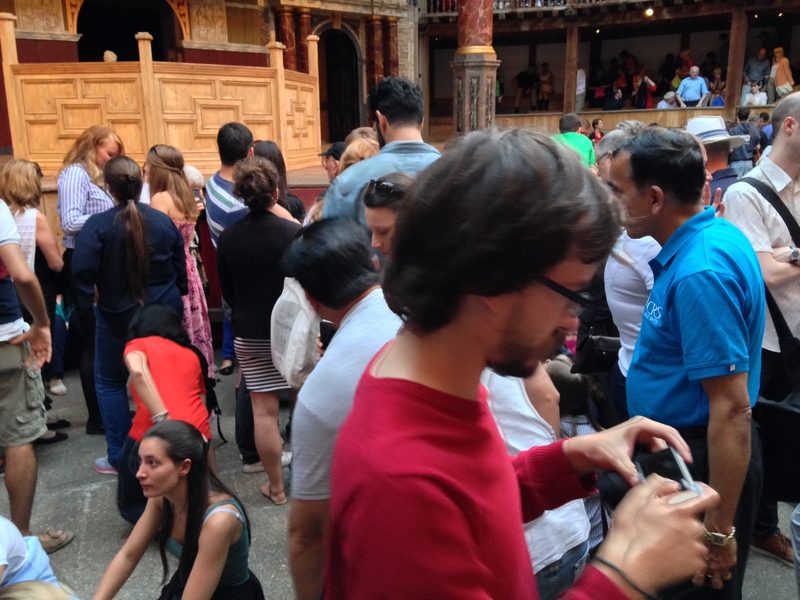 I’m heading back to London next week to see three more shows, including Antony and Cleopatra back at The Globe. This time I’m sitting down, though. *I bring this topic up, partly because I wonder how many people look at my time over here in 2012 as a sort-of failure. “Ah, he ran out of money and didn’t finish the degree. Poor, poor Brian.” It’s hard to control the narrative of your life, but I’ll tell you, it was the smartest move I could have made. I avoided a LOT in student loans and got the credits I needed for a theatre endorsement (which is all I really wanted or needed.) I had a lot of pining away for more time over here, though, and that’s why this summer has been so enjoyable. I’m filling up the cup nicely. **I mean…I do, but I won’t bore you with all of my theoretical thoughts on a show no one else saw.